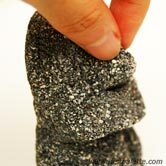 Pique a child’s interest in history by recreating the ancient stone-carved statues of Easter Island using self-hardening dough or clay. “There exists in the midst of the great ocean, in a region where nobody goes, a mysterious and isolated island,” wrote the 19th-century French seafarer and artist Pierre Loti. “The island is planted with monstrous great statues, the work of I don’t know what race, today degenerate or vanished; its great remains an enigma.” Named Easter Island by the Dutch explorer Jacob Roggeveen, who first spied it on Easter Day 1722, this tiny spit of volcanic rock in the vast South Seas is, even today, the most remote inhabited place on earth. Its nearly 1,000 statues, some almost 30 feet tall and weighing as much as 80 tons, are still an enigma, but the statue builders are far from vanished. To early travelers, the spectacle of immense stone figures, at once serenely godlike and savagely human, was almost beyond imagining. Just 14 miles long and 7 miles wide, the island is more than 2,000 miles off the coast of South America Easter Island possesses a rugged beauty—a mixture of geology and art, of volcanic cones and lava flows, steep cliffs and rocky coves. History, as much as art, made this island unique. When did the first people arrive? Where did they come from? Why did they carve such enormous statues? How did they move them and raise them up onto platforms? Why, after centuries, did they topple these idols? Such questions have been answered again and again, but the answers keep changing. In the native language, the island and the people are called Rapa Nui. Platforms are called ahu, and the statues that sit on them, moai (pronounced mo-eye). Their faces are paternal, all-knowing and human—forbiddingly human. On the island there are seven Moai who do not not watch over the land like most of the island’s statues with their backs to the sea. These stare out beyond the island, across the ocean to the west, and remember where they came from. 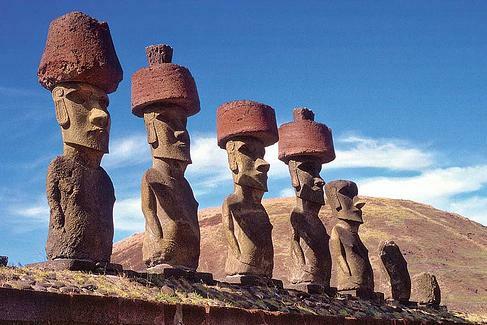 When the first king of Easter island, Hotu Matu’a, arrived on the island he brought seven different races with him, which became the seven tribes of Rapa Nui. These moai represent the kings of other Polynesian islands. 2. You can make a miniature of these statues using commercial self-hardening clay or make your own sand dough or salt dough. I prefer using sand dough because it dries into a somewhat gritty stone-like material. 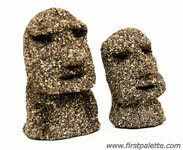 The Moai statues are mostly grayish or brown in color. All the above mentioned materials can be colored by adding a bit of acrylic paint or poster paint. Take note that for sand dough, the paint only colors the dough and not the sand particles, giving the dough a unique granite-like look. 3. Before starting your sculpture, check the consistency of your sand dough or salt dough. It should be firm enough to support an upright sculpture. You can make a random block from it and see if it holds up or sags. If the dough is too soft, you may add more sand for sand dough and more flour and salt for salt dough. Once content with the dough’s consistency, take a chunk and use your hands to mold it into the statue’s main shape. Moai statues have really large heads that are about three-fifths the size of their bodies. 4. Make the jaws more squarish – a wide angular jaw is a defining feature of these statues. Pinch the middle section of the face to make a nose. If the dough has become too dry to shape properly, moisten your fingers slightly and continue working on your sculpture. 5. Use your little finger to carve out the eyes and the opposite end of a spoon to make the mouth. 6. Make the finishing touches. I’ve squared my statue’s jaws further and made two dimples on either side of the body to define a pair of arms. When you’re happy with your sculpture, allow it to air dry. Turn it from time to time to allow all areas to dry. Drying will depend on several factors such as temperature, the size and thickness of your sculpture and the moistness of your dough. My sand dough sculptures took about a day to dry completely. 7. A special note on making thick block-like sculptures with sand dough – they are prone to cracking as shown in the photo. Cracking happens because the surface of the sculpture dries a lot faster than the inside. On a hot day, the moist dough expands and forces its way out, causing cracks. Cracking can be prevented by turning your sand dough sculpture from time to time so that drying is more even on all sections of the sculpture. Making small deep grooves at the back or base of your sculpture (where they won’t be as conspicuous) while the sand dough is still moist will help relieve the pressure and aid drying. 8. 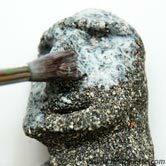 Once your sculptures are completely dry, you may apply 2 to 3 coats of clear acrylic sealer or decoupage medium (e.g. Mod Podge) to keep out moisture. Let each coat dry before applying the next one. 9. The grainy quality of sand dough made these simple sculptures quite unique, don’t you think?Thank you First Pallette for this fantastic art history project!